Every Major scale has a Minor Scale contained it. So, the Major Scale and its Relative Minor Scale actually contain the exact same notes. The difference between the two is how they are played, meaning -which notes you play and in what order. They can also be broken down into patterns of whole steps and half steps. 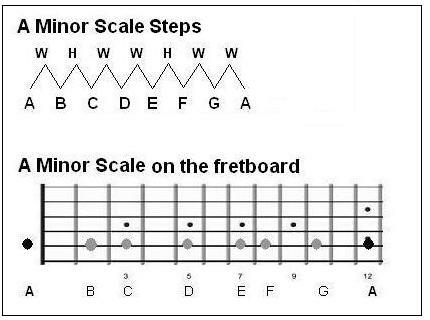 If you recall a whole-step is the distance of two frets (skip a fret). A half-step is the distance of one fret (frets that are side by side). Below are two octaves of the C Major Scale with its Relative Minor "A Minor" highlighted. Also Note: Every Minor Scale begins on the 6th or "La" interval of the Major Scale.